The Newbury Weekly News published an online article on The Basingstoke Project today. If you’re confused about where we’re from (Newbury? Basingstoke? ), that’s easily explained – some of us live in West Berkshire, some of us in Basingstoke and Deane. 27 November (Fri) – Open 10am to 1pm. Friday 27 is now our final day and we’ll be taking down in the afternoon. In the back room we prepare for our exhibition. There is a lot of time-consuming work done to stage an exhibition and some of it tedious! But we have collectively put all the elements together and produced our first exhibition at the Creation Space Gallery. I hope our visitors won’t be disappointed with the display. And, will be impressed enough to come along to the next one! 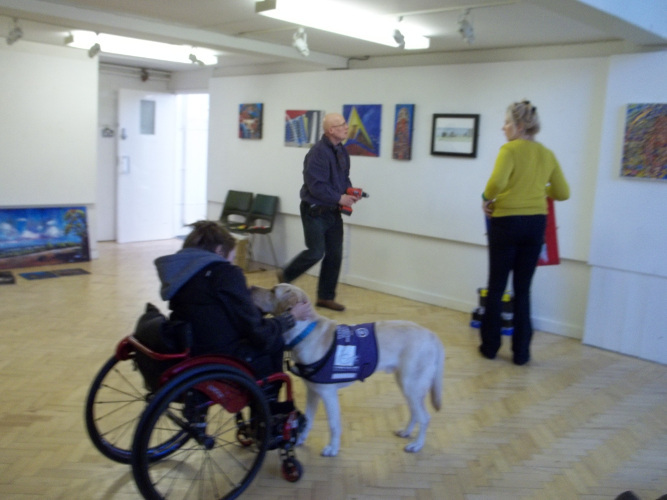 We knew that the gallery space we are using for The Basingstoke Project would be used for the occasional class, and we thought that we knew when they would be. Unfortunately, it turns out that there are more classes than we were aware of. The flyers are wrong (again; we have already used stickers to add “closed” times). Hopefully there will be no more changes. We are all local artists, and we decided to join forces after discovering how much we had in common during last May’s West Berkshire and North Hampshire Open Studios. is our first collaborative project, and our first exhibition together as a group. We decided to focus on the town because it is a natural focus point, and because we didn’t think that Basingstoke had come under artistic scrutiny very often in the past. an active, reactive, artistic response to the people, places, buildings and character of Basingstoke. A project to inspire and surprise. In the course of the project, we learned to look again at the town. We were inspired. We were surprised. We found hidden gems; we found delight in the familiar; we found our own visions of Basingstoke. We hope that you enjoy the exhibition, and that you leave with your eyes and your mind open, and with joy in your heart. An almost-finished-installation view. From left, Urban life lines and Incredible Edible, both Rosemary Lawrey; St. Michael’s Church, Brian R. Marchant; Ghost, Amanda Bates; By Loddon’s burning autumn banks, Rosemary Lawrey; De Port’s kitchens, Amanda Bates; Holy Trinity I, II and III, Brian R. Marchant; Night out in the rain, Brian R. Marchant; and Basingstoke in sight, Rosemary Lawrey. I’m hoping that there will be better pictures available, but for now, you’ll have to rely on my hastily shot not-quite-finished-installation view, taken this morning when we were finalising the exhibition for the Private View in the afternoon. The Private View went very well, I think. I have only the vaguest idea of numbers, but there was a steady stream of visitors, lead by the Deputy Mayor of Basingstoke, in her official capacity – who actually did arrive before anybody else. She expressed a personal appreciation for art in general before entering the gallery and she certainly seemed to enjoy viewing our work. We also played host to a smattering (or should that be a splattering?) of fellow-artists, a couple of representatives from the churches we had depicted, the proprietor of the local Web site It’s Basingstoke not Boringstoke, and assorted others. It was truly lovely to see every single one of our visitors, and gratifying to hear their overwhelmingly positive responses to the exhibition. I am looking forward to reading their comments in the Visitor’s Book. Today we started installing the the Basingstoke Project. I had to leave early for domestic reasons, but I know it is in safe hands. I have seen the whole of the Basingstoke Project, and it is good. I speak not of my own work, but of the others’. Uncertainty and frustration may have plagued various members of the group at different times, but all five of us have pulled through and, indeed, pulled something rather magical out of the hat. … Brian has demonstrated how the simple medium of pen and ink can have depth, and wit, and enormous variety. He has pushed his illustrative style into new realms (in one case, quite literally!) for this exhibition. … Elinor has produced some of the most striking images. Hard lines and curves, perfectly placed, shown to perfection in gleaming prints on aluminium. 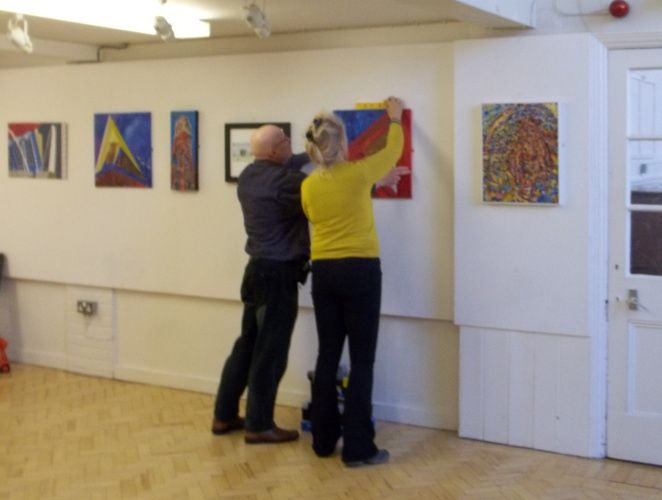 … Rosemary has scoured Basingstoke for the bold shapes and brilliant colours that typify her work. Dark dryads and thrillingly vibrant fruit meet the sharp lines of modern architecture. Abstraction is never far away, but is only fully expressed in one work. I chose to seek special people in Basingstoke, and a couple of them I know, and so that meant I had a vision of the painting beforehand. In reality, it was very different and harder to manoeuver than I could have ever imagined, and, what’s more, I had a couple of images of different people on the go at the same time. Although it was very hard, I was in the end very pleased with the new way it made me work. This is Rosemary. She is a wonderful person, so I just hope I have done her justice. 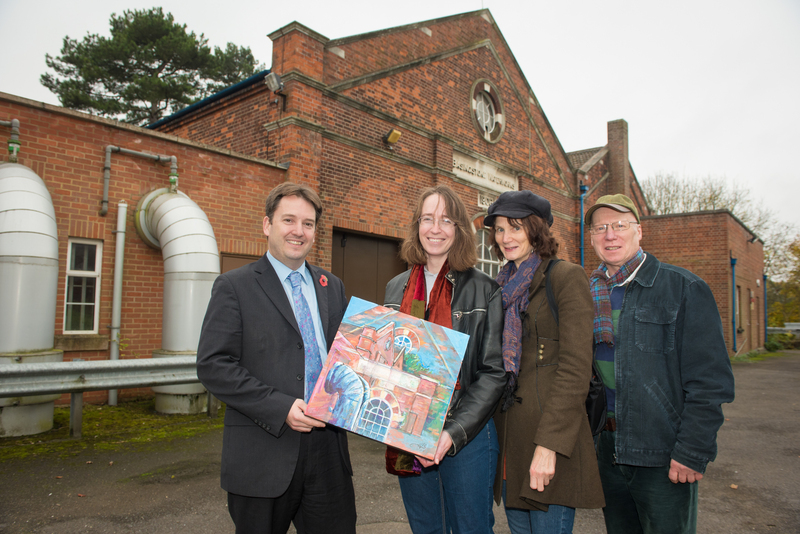 Two weeks ago, I sketched at Basingstoke Waterworks. Those sketches became the basis of a painting, which can be seen in the photograph and (of course) at the exhibition itself! The article is currently live on the Gazette Web site and is due to be published in the paper.